The same is still true today, thanks to the continued efforts of developer Chronos to introduce new features with each subsequent version, such as the ability to add movies or audio files to scrapbook pages, 3D headlines, texture overlays, and one-click photo frames, all while remaining intuitive and easy to use. Compatibility updates aside, could there be any newer features worth adding? The new color wheel offers a limitless number of choices for embellishing any scrapbook project. Judging from iScrapbook 7 ($50 single user; $90 family pack) the answer is yes, as this impressive update arrives with a singular focus on color. 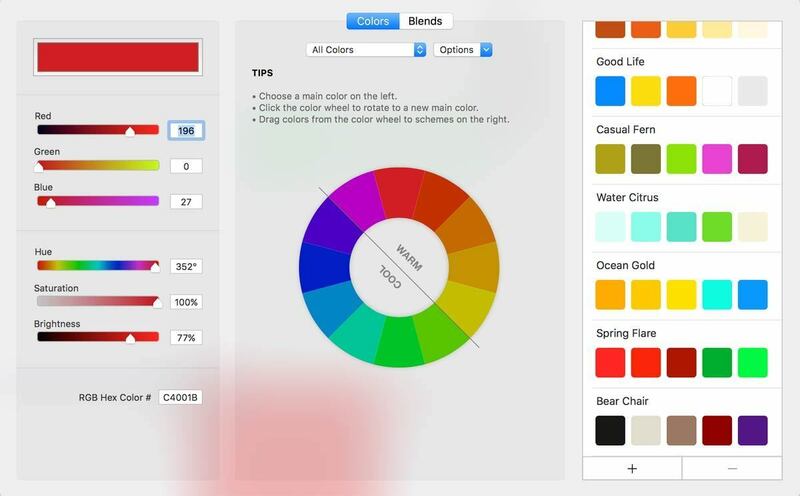 The change is apparent throughout the user interface, most notably with the addition of a new color wheel that allows users to discover complementary color combinations by using techniques familiar to artists. The edit window is split into three sections: At left, Photoshop-style base color sliders for red, green, blue plus hue, saturation, and brightness; the color wheel itself in the center, which can be displayed in traditional (RYB) or modern (RGB) primary views; and saved color schemes on the right side, which are accessible throughout the application. Several presets are included, but it’s super-easy to create your own in a few clicks. That’s because iScrapbook 7 introduces the ability to analyze inserted photos and quickly create a custom color palette created from its dominant colors. This is done by first selecting the photo, browsing to Image > Analyze from the right-hand design sidebar, and clicking the Analyze button. Results appear in the blink of an eye, each with five primary hues that can be saved and applied throughout a project. Additional hues are available by using the pulldown menu to display only lighter or darker color options, but users can save an unlimited number of color schemes, each with a custom name. I did find one small bug that caused color schemes to vanish when reselecting analyzed photos, but toggling the pulldown menu temporarily restored them. iScrapbook 7 includes a powerful new color wheel for creating or editing just the right hue for each project you’re working on. 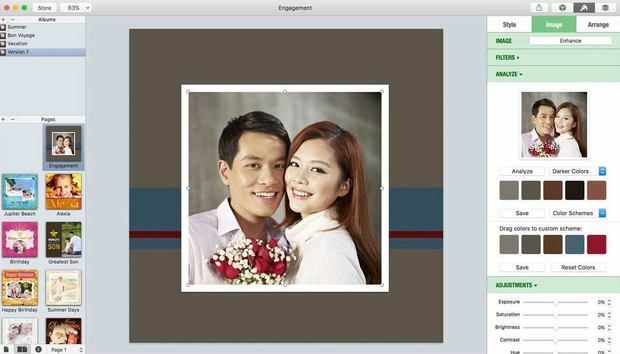 Analyzing photos isn’t the only way to bring a splash of color to iScrapbook 7 projects. There’s a new eyedropper tool which can be used to pick colors from anywhere on your screen—even outside of the application—and apply them to selected content. You can also use the standard Mac color picker, although it’s positively feeble compared to what Chronos offers. Divided into warm and cool shades, the color wheel also includes a Blends tab, which can be used to create up to 100 shades, tints, or tones from a pair of dominant colors. Finally, users can choose from a dizzying array of color wheel display modes, including analogous, triadic, and several complementary, compound, and rectangular choices. The downside of any major update so focused on a specific feature category is there’s no room for anything else. Outside of the color-tinged overhaul, version 7.0 is identical to its predecessor. Every new feature involves pigment, from color schemes all the way down to the built-in hex field used to copy or paste colors from other applications. Normally the lack of new feature diversity would be disappointing, but after a decade in development, Chronos has already introduced every bit of technological wizardry scrapbookers could ever want. If you’re an existing user who doesn’t need more robust color tools, you can stick with iScrapbook 6.0.9 for now, which is fully compatible with the latest macOS Sierra. 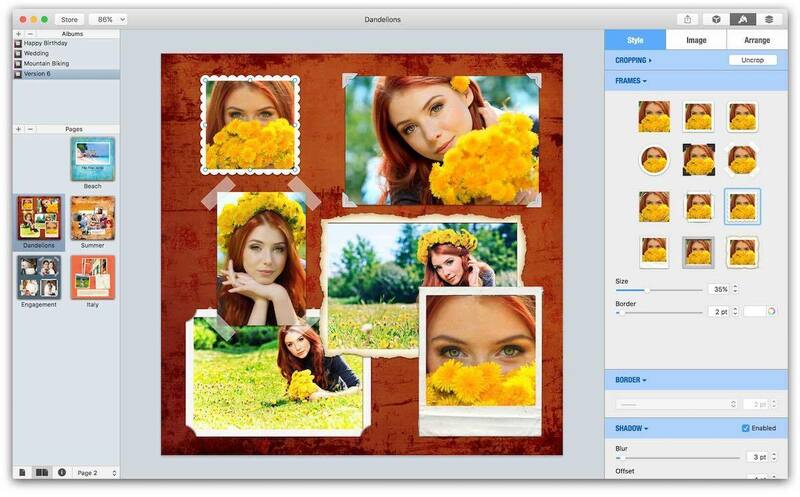 Aside from new color tools, iScrapbook 7 includes all of the previous features, such as the ability to add custom frames with a single click. 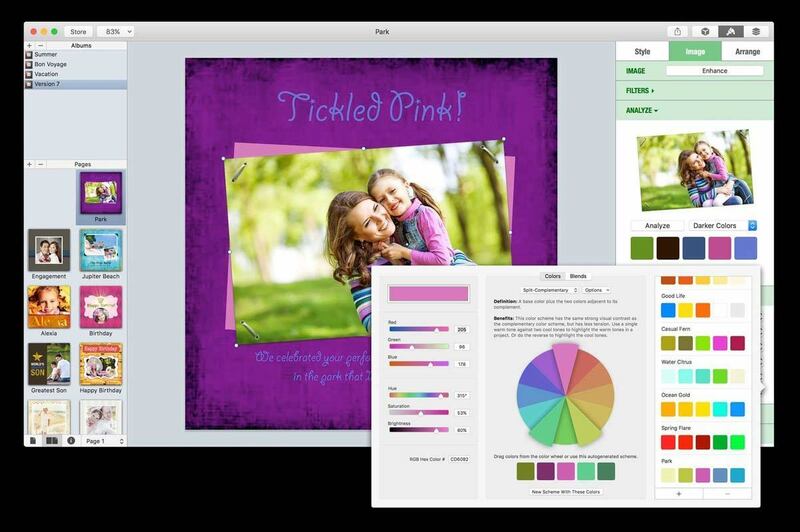 iScrapbook 7 is laser focused on new ways for scrapbookers to interact with color, introducing an extensive palette of new features that makes this an upgrade worth buying. « Is the rocky road to EMV retail adoption getting smoother?